As you may know CQRS stands for Command Query Responsability Segregation. This basically means that you will implement two separate systems, one for managing commands (C) and other for managing queries (Q). They get synchronized by “something” in the middle. Here we will also cover a “special” way to store the command data: event sourcing with Event Store. Storing events means that you store what has happened in the system as an event series, not in a structured way. For instance you don’t have a table called Clients (Relational way), or you don’t have an aggregate with all event info in a document (NoSQL), you just store the event client created in client-X events stream. So at the end you will have a lot os streams, maybe one per client, and all client’s events inside its stream. In the image you can see the stream “Bank-Client-38794” (38794 is the client id) with two events: ClientCreated and MoneyDeposited. As you can see events are just serialized JSONs. I have implemented a few services which handles NServiceBus commands, they receives messages, store events (these events are at model-eventsourcing level) and maybe propagate more events to the bus. Here you can see the handler for the CreateClient bus command. /// This handles the CreateClientCommand. It stores the create client event and make the first deposit. It is simple. The first difference is that the event sourcing approach is more DDD style and less like commands that uses classes with properties against a database. It is more OO :). – When a client is created a ClientCreated event is raised. When an event is raised it is applied to the instance (see Apply function) and also it is stored in a list of uncommitted events (in the AggregateBase class). – Also the same for Deposit, this function makes the validations (not in this case :)) and call to RaiseEvent. – Calculates the aggregate version expected and original. The version at the end is the number of events in the stream. 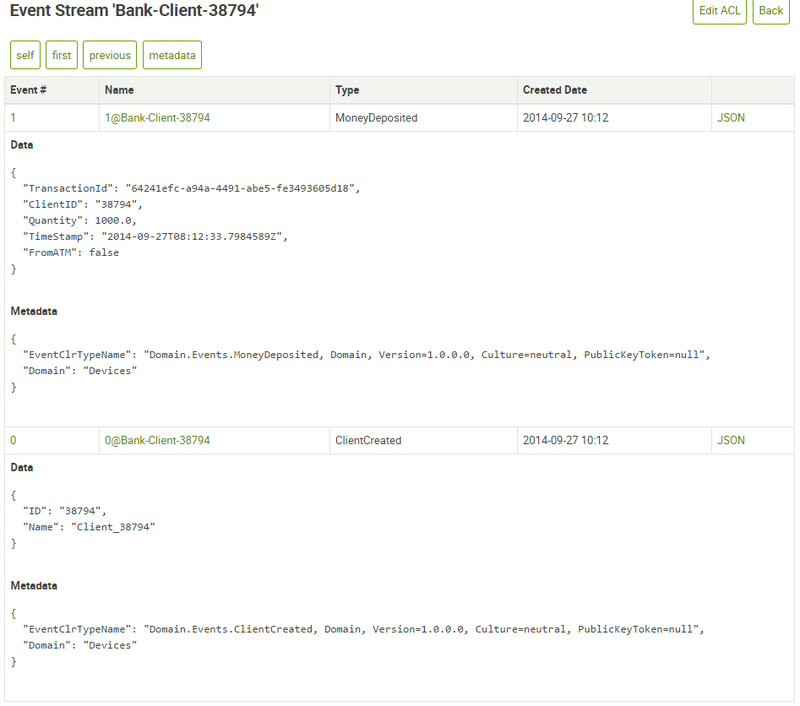 – Creates the stream name, in this case it has the following format Bank-Client-ClientId. – Calls to event store for saving. And that’s all at the saving events part. Of course there are more complicated stuff regarding EventStore and NServiceBus, but that’s for more detailed posts. Ok, now we have a client. This client could go to the bank to deposit more money. – and call to the function BuildAggregate. BuildAggregate applies every event to the object and return it when finished. We have with that the current version of the object. With all of this we have again the Client created and now we can work more with it. Next post: the read model. I’m still studying your solution example. It’s very good. Based on your experience, do you usually create a CrossCutting library like the one in the example for each project? Or you use a more generic one like CommonDomain (NEventStore)? Sorry but I don’t really understand the question. I use the crosscutting for common utils code, not logic, so it can be shared between projects.